Some artists are well-travelled, and then there's Guillaume Azoulay. Born in Casablanca, Morocco in 1949, a resident of Paris from the age of 10, later of Israel, and now, in his present home in Nevada, Azoulay has quite possibly redefined what it means to be a cosmopolitan artist. With such a strong history and commitment to seemingly endless journeys, it is perhaps not a great surprise that even his art is composed of continuous lines. We aren't kidding about the above. If there's one thing, and one thing above all else, that sums up Azoulay's artistic philosophy, it is a determination to show all of the expressive uses to which a seemingly simple design element as the line can be put. Not for no reason is Azoulay now frequently referred to as the 'King of the line', for his approach to it is an organic one embodying enduringly appealing qualities such as balance, harmony and contrast. Azoulay's line is also, for all of the limitations of the drawn medium, an apparently constantly moving one, much like the artist himself. Indeed, it is not unheard-of for the artist to create a single work of art without ever lifting his pen from the paper, even if - such is his mastery - you would be hard-pressed to tell this by merely glancing at the finished piece. Now, all of these references to lines may have initially led you to presume that Azoulay was an abstract artist, perhaps, or one with a penchant for geometric elements. 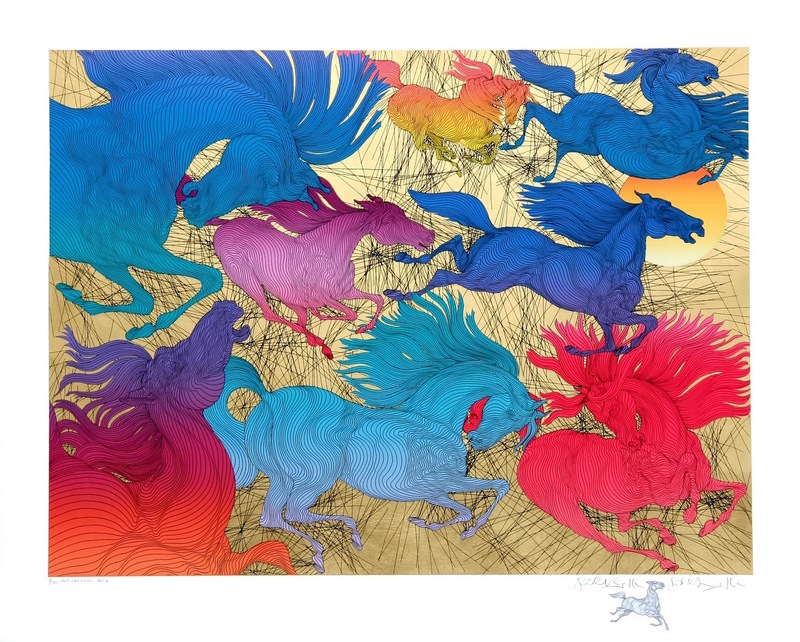 He is in fact, a lover of representational motifs like horses, dragons and dancers, using his singular line-driven style to evoke their graceful movement. “By deconstructing the subject and reducing it to its bare bones – in this case the very lines which suggest a subject – you then consider the very make up of these lines. You isolate the very particles which form the line, and those particles are transmuted into ever-evolving subjects themselves. By outlining them graphically or giving them a shape through colour, your original line is now the subject,” explains Azoulay. An 'artist of the week' feature on such a well-travelled creative as Azoulay surely befits a re-treading of the monumental journey that he has undertaken - both on land and on paper - from a young age. After the relocation of his family to the French capital, it took just a few years for a then still only 13-year old Azoulay to begin selling his sketches on the Parisian streets, signalling a fledgling artist already with a clear sense of what he wanted to become. So sure was that sense that just a year later, he left home independently for the first time, embarking on a hitchhike across Europe and the Middle East that would do so much to inform his early art. “The first ride that came along was a truck-load of Gypsies – of course I jumped in immediately!” Copenhagen, Rome, Lisbon and Jerusalem were just some of Azoulay's stops on his momentous teenage trek, as he further demonstrated and developed the resourcefulness that would lead him to not only teach himself art, but also gain fluency in five languages. If there is any artist over the years who has shown that he simply doesn't need much external support to get on with his creative practice and achieve great feats, it has to be Guillaume Azoulay. Since seeing his application for a place at the famous Middle East art academy Betzalel rejected as a youngster, he has gone on to have several of his works accepted into the Musée du Louvre's permanent collection - indeed, he is the youngest artist to have received this honour. The considerable official admiration for Azoulay's work was clear back then in the comments of the Louvre's chief curator that, "He is an artist whose varied works let us predict a very bright future." However, he has also been able to count many heavyweight international figures outside the art world among his collectors, from Ronald Reagan and Francois Mitterrand to Prince Rainier and Prince Karim Aga Khan. Overall, Azoulay's art may be largely based on the simple device of the line, but the results that he achieves from it are far from simple, showing a level of detail and depth in such elements of his subjects as their eyes, expressions and musculature that few of his contemporaries would contemplate. As artist Richard Mann noted, “The brilliance of Azoulay’s art centres on his ability to utilise the purity of line to create powerful illusions of sculptural volumes in motion…” and that, my friends is why Guillaume Azoulay is a favourite at Addicted Art Gallery.